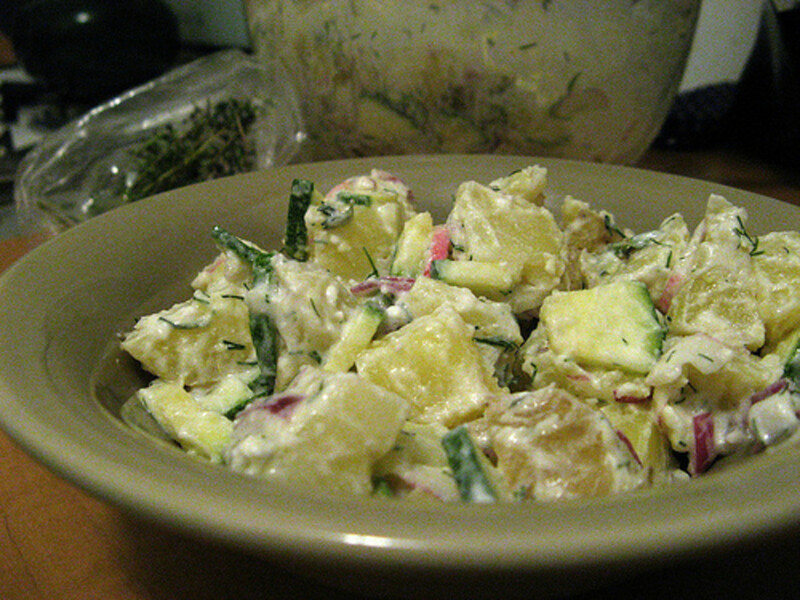 Is healthy potato salad an oxymoron? Despite the weather (I wonder if the rain will EVER stop! 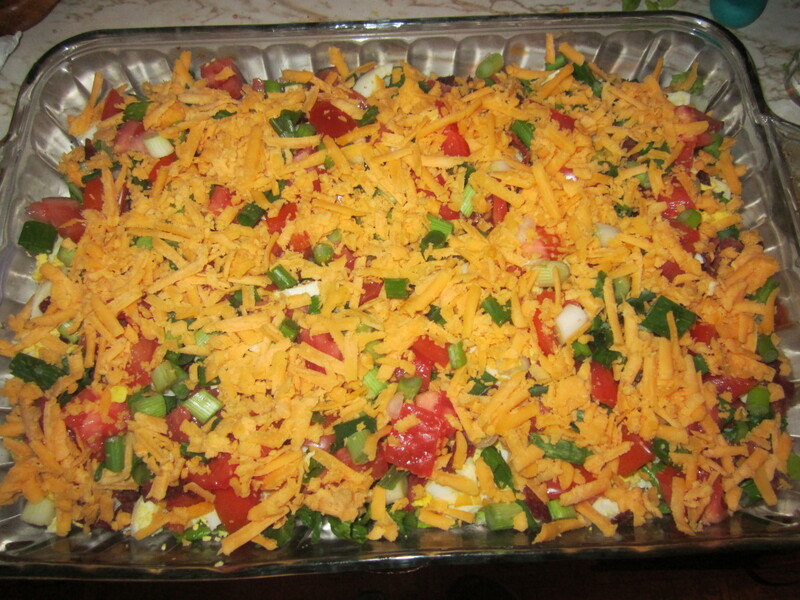 ), I am determined to create a summer-like dinner for my family this evening. On the menu are oven-barbequed chicken tenders, corn on the cob, some canned baked beans, a strawberry coleslaw, and a lighter and brighter potato salad. 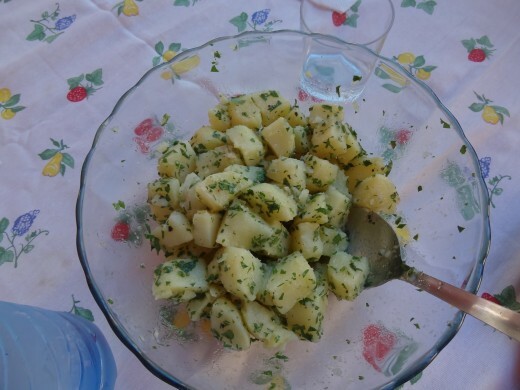 I love my Mom's traditional potato salad, with russet potatoes (that become a bit soft when cooked and lend to the creaminess of the salad), dill pickle, hard cooked eggs, celery, mayonnaise, and (here is the secret ingredient!) finely minced radishes. But I wanted to create something a bit lighter this evening. So I used Yukon gold potatoes (a less starchy potato that remains firm when cooked), some fresh herbs, and an acidic dressing rather than mayonnaise. Use the proper potato—Mom always used russet (Idaho) potatoes. Russets are wonderful baked or used in casseroles; their low-moisture high-starch flesh is the perfect foil for cream and butter. But cook a moment too long and they make horrible potato salad. A better choice is the Yukon gold. With their rich, buttery flavor and a moist, creamy texture they make exceptionally good mashed potatoes, French fries, and potato salad. Their medium starch content makes them a good all-purpose potato suitable for both boiling and baking. Shake the salt—High blood pressure is at epidemic levels in the United States and our passion for sodium-laden fast-foods and processed foods is a major contributor to the problem. How do you add flavor to your foods without using the salt shaker? In this recipe, lemon zest and lemon juice provide a tang and brightness without the addition of sodium. Parsley is more than just a pretty face—This ubiquitous garnish on dinner plates is so much more than a decorative afterthought. Parsley is a nutritional powerhouse--a source of vitamins C, K, and is rich in anti-oxidants. The two most popular types of parsley are curly parsley and Italian flat leaf parsley. The Italian variety is more fragrant and less bitter than the curly variety. When shopping for parsley select a bunch that is deep green in color and looks fresh and crisp. Keep your fresh parsley in a plastic bag in the refrigerator. Don't wash it when you bring it home. It is highly fragile and should be washed just before using. The best way to clean it is just like you would spinach. 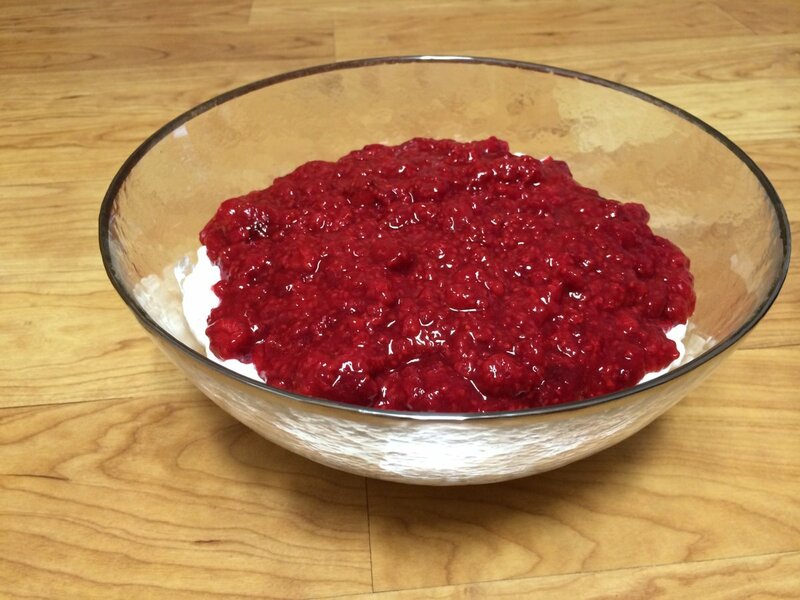 Place it in a bowl of cold water and swish it around with your hands. This will allow any sand or dirt to dislodge. Remove the leaves from the water, empty the bowl, refill it with clean water and repeat this process until no dirt remains in the water. PegCole17 thank you for the positive feedback. I hope your husband likes this spin on potato salad. This is a nice alternative to using mayonaise which the hubby doesn't like. Great idea and easy preparation directions. That dinner sounds delicious, too. Thanks Paul Edmondson. I think it might be interesting to explore other additions--what about fresh oregano or cilantro? Or perhaps olives (I like Kalamata but green could work too) or a few capers? Interesting. I love a light potato salad.